We breathe more than we do anything else. Breathing air is more important, and more vital moment to moment, than food or water. Fresh air, of course, is the best. You may be with your cancer patient at the hospital. Or at home with a garden, or in an apartment building. If your loved one is recovering from surgery, getting outdoors may be hard. But if you can, get outdoors, every day, even if just for a moment. 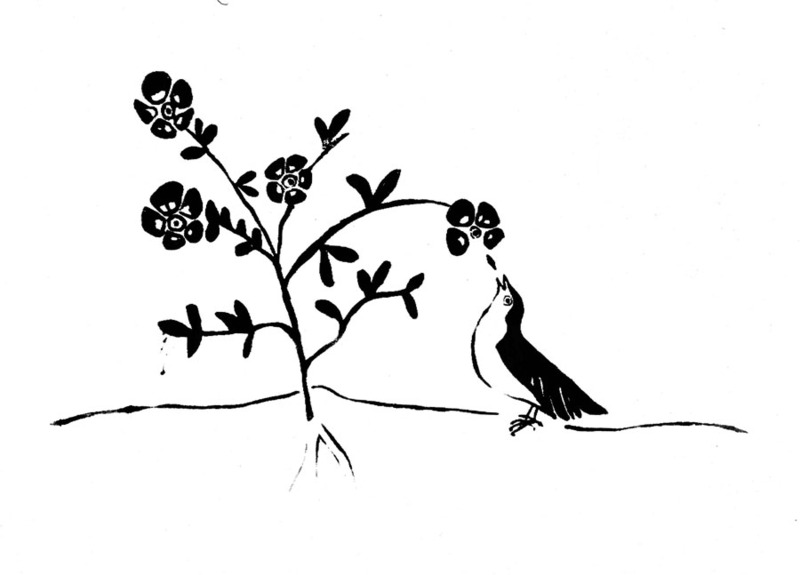 The fresh air will feel good, the sun will give your loved one needed vitamin D.
A silk screen print of mine...to remind us that birds and flowers will improve your mood and attitude! If you cannot get outdoors, open a window. Hang a bird feeder outside your patient's window. Or bring in some flowers or plants. This is not just about the air that we breathe because we need air to survive. It is also about holistic health. It is about body, spirit, mind. The change of scenery, the feeling of the air, the sounds of the birds, the smells outdoors. They have more value to the spirit than you know. And that makes the body stronger. The following recipe for me is like fresh, tropical air in your body. It is from Mark Bittman, the New York Times food writer, whom I love. 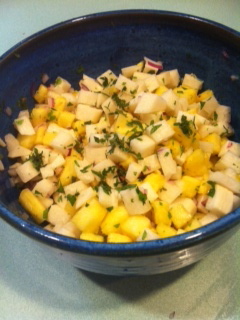 -In a bowl, combine jicama, lime juice, chile, salt, and pineapple. Taste and adjust the seasoning. -Toss in half the scallion and mint, then garnish with the remainder and serve. -Jicama: High in fiber, potassium, iron, calcium, vitamins A & B-complex, and vitamin C.
-Onions: May increase protective enzyme that helps inactivate and eliminate cancer-causing agents. -Mint: An array of vitamins & minerals, folate, and vitamin C.
-Pineapple: High in vitamin C and calcium!